Slow Cooker Black Eyed Peas are easy to make and super flavorful! 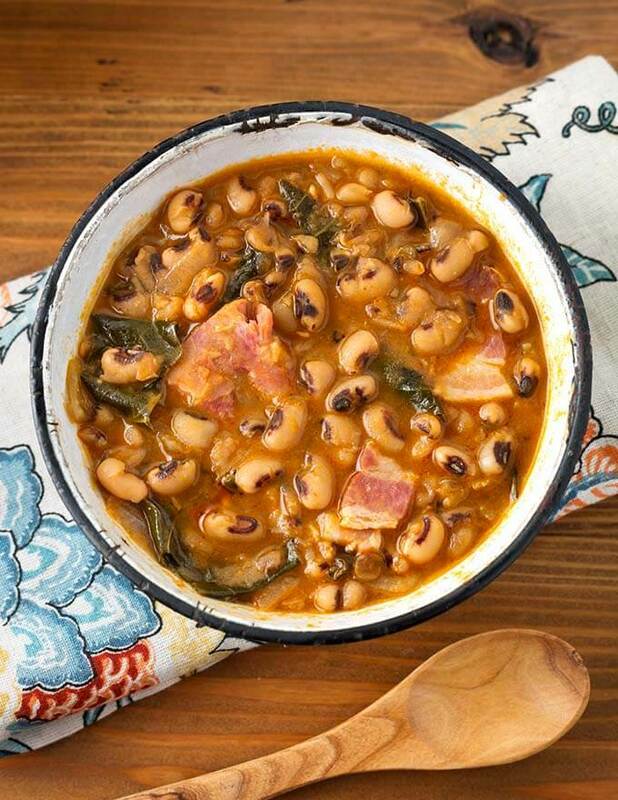 Ring in the New Year with a lucky and delicious bowl of crock pot Black Eyed Peas with ham and collard greens. Cooking with real food, as they call it, is very satisfying! I like the smell of dried black eyed peas when I rinse them. Same with collard greens. Such a green and earthy fragrance. Thank you farmers, for growing food and working the land! There are a lot more people who eat black eyed peas on New Year’s Day than one might think. I was surprised by the many people who told me that it is a tradition for their families. It started in the Southern United States, but more and more Americans are adopting this traditional meal. 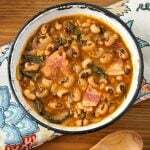 Eating black-eyed peas and collard greens on New Year’s Day is said to bring one good luck. The more black eyed peas you eat, the more luck you’ll have. Load me up! 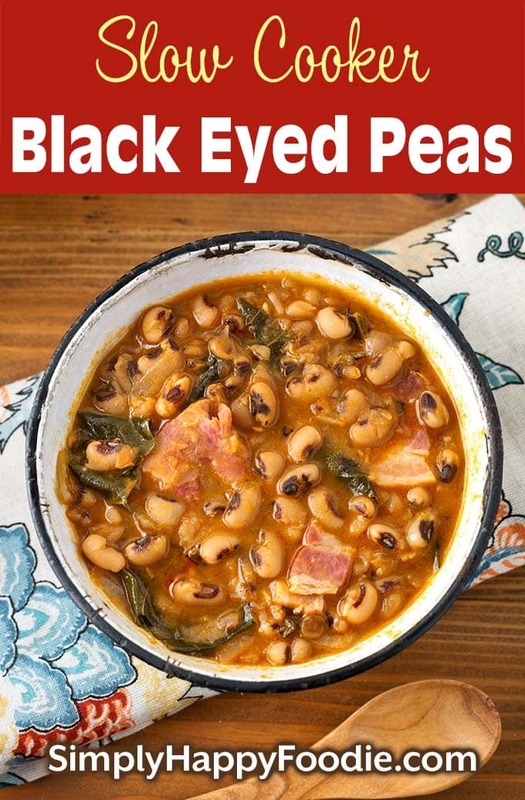 The black eyed peas (actually beans) swell up when they are cooked, and that symbolizes prosperity; the greens (usually collards) symbolize money; the pork, because pigs root forward when they are foraging, so it represents positive motion. This recipe is really easy to make. After you soak the black eyed peas, you just add them to the crock with most of the other ingredients. Then go about your day until it’s time to add the collards, if you are having them. Then let it cook a while longer, and when this crock pot black eyed peas is ready, you will be so happy you made it! The flavors are really excellent! Savory, smoky, and wonderful! 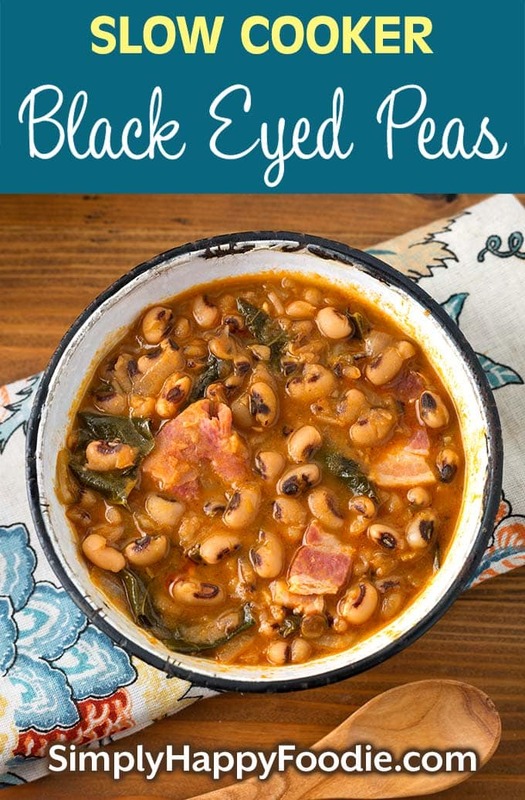 Slow Cooker Black Eyed Peas are easy to make and are very flavorful! 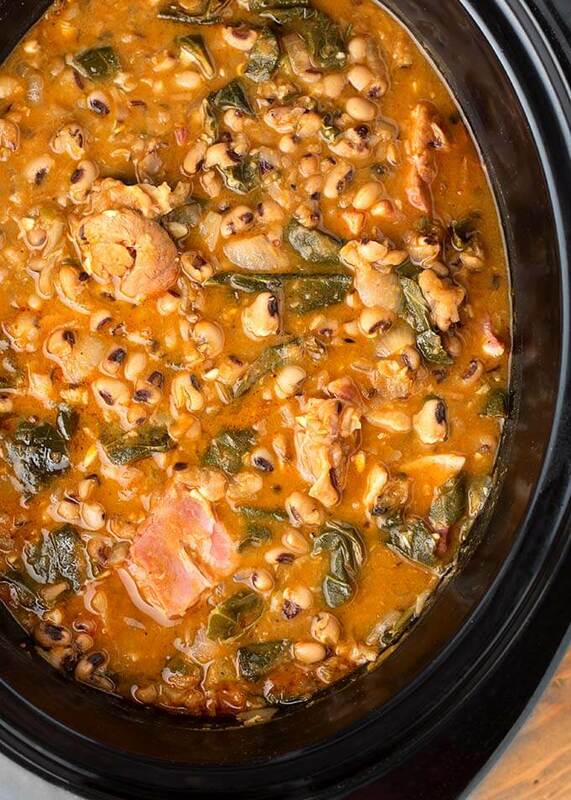 Ring in the New Year with a lucky and tasty bowl of crock pot Black Eyed Peas with ham and collard greens. Add the soaked and drained Black Eyed Peas to a 6 qt or larger slow cooker. Pour in the broth, then add the ham hock, bacon, onion, bay leaf, rosemary, jalapeño, garlic, smoked paprika, and thyme. Stir. Place lid on the crock and cook on high for 4 hours or Low for 6 hours. Then add the salt, pepper, balsamic vinegar, and collards, if using. Stir well. Cook another 1 to 2 hours, or until beans are done and meat comes off of the bone easily. Time will vary by how long you soaked the beans and if you are using High or Low temp on your slow cooker. Remove the bay leaf and rosemary stems. Taste and adjust salt, if needed. Serve over rice, or as is in a bowl. Delicious! Loved the smoky flavor. The black eyed peas we’re done perfectly!